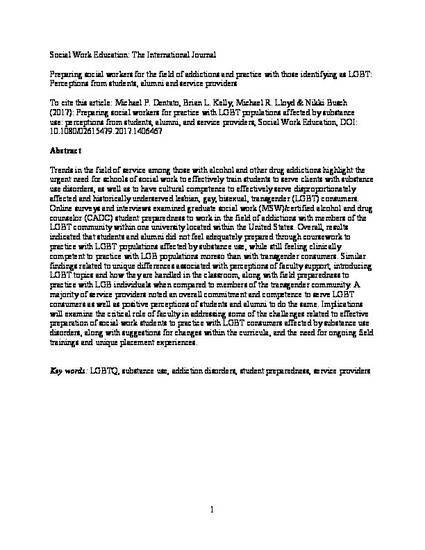 Trends in the field of service among those with alcohol and other drug addictions highlight the urgent need for schools of social work to effectively train students to serve clients with substance use disorders, and have cultural humility to effectively serve disproportionately affected LGBT consumers. Online surveys and interviews examined perceptions of graduate social work students and alumni in a certified alcohol and drug counselor program, along with several service providers within an urban setting in the US. Results indicated that students and alumni did not feel adequately prepared through coursework to practice with LGBT populations affected by substance use, while feeling more clinically competent to practice with LGB individuals, than with transgender consumers. Similar findings related to unique differences associated with perceptions of faculty support, along with field preparedness to practice with LGB individuals when compared to transgender individuals. Service providers noted an overall commitment and to serve LGBT consumers as well as positive perceptions of students and alumni to do the same. Implications examine the role of faculty in addressing challenges related to preparation of social work students to practice with LGBT consumers affected by substance use disorders, along with suggestions for curricular changes, and ongoing field trainings.